30ft X 15ft SE Facing Pool. 1st Master En - Suite Bedroom. Calabay Parc is one of the most elegant, Most sought after, stylish and celebrated vacation communities in central Florida. It is a highly exclusive development situated in a conservation area surrounded by Orange Groves and woodland. All lawns and landscaping are maintained on a regular basis to keep up its immaculate appearance. There is a beautiful brook running through the community and nearby is a nature/fitness trail. New for 2004 a Children�s play area is planned along with Tennis and Basketball courts. Calabay Parc is situated on Highway 27 and is within minutes of many golf courses including the spectacular Champions Gate Golf Complex. Three courses designed by Palmer, Nicholas and Watson only 5 Minutes away. Two miles North on Hwy 27 is a new Publix supermarket along with other convenience stores. A new Super Wal-Mart is a further 3 miles, just over the junction of the ever popular Hwy 192. Six miles South on Hwy 27 is a Super Wal-Mart, restaurants, filling stations, banks and lots of other outlets. Interstate 4 is just 4 miles South on Hwy27 taking you straight to the Parks. Disney World is an easy 10-15 minute drive and Universal, Sea World and all other attractions are just a few minutes further. Calabay Parc is an immaculately maintained, peaceful community and our home is finished to an exceptionally high standard. Picture yourself waking up to another glorious sunny day, walking out to your own private pool, taking an early morning pre-breakfast dip letting the luxurious warm water lap away the stresses of work and everyday life. Before tackling the theme parks or shopping!! What better way to start the day. If you want to do a spot of sea fishing or just laze on a beach it is a little over an hour's travelling distance of the beautiful sandy beaches on the Gulf and Atlantic coasts. Nearby are many restaurants, fast food outlets including A very a nice Chinese take-away, Pizzas and Burgers to name just a few. If you just want to relax and unwind what better way than by relaxing beside your very own sun drenched pool with all home-from-home conveniences at your fingertips. Why pay for a hotel room when you can have so much more! Our beautiful villa is Air conditioned throughout and can comfortably accommodate up to 10 people as in addition to the four bedrooms there is a queen sized sleeper sofa in the Family Room. The front door is fitted with a keyless locking system alleviating the problem of carrying keys around and the possibility of losing them. 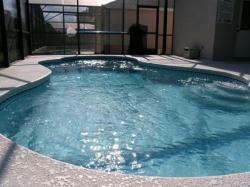 The private SE facing pool is approx 30ft X 15ft. and has underwater lighting. The extended pool deck is furnished with upgraded pool furniture for your comfort. 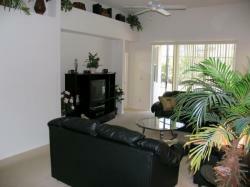 There is a covered lanai/patio with lighting and ceiling fan for those warm balmy evenings watching the sunset. For added safety there is a purpose made removable child safety screen which fits around the pool should you wish to use it, but children should not be left unattended in the pool area at any time. Has a King size bed with en-suite facilities i.e. bath, toilet, twin wash basins, separate shower cubicle, walk-in wardrobe, dressing table, night stands, ceiling fan, air conditioning, telephone, DVD Player and cable TV. Has a King size bed with en-suite facilities i.e. bath, toilet, wash basin, shower, walk-in wardrobe, dressing table, night stands, air conditioning, pool access Telephone and cable TV. This Bedroom has 2 Twin beds a night stand, walk-in wardrobe, air conditioning, cable TV and a PS2. It shares a Bathroom/Shower with Twin Bedroom 4. This Bedroom has 2 Twin beds a night stand, walk-in wardrobe, air conditioning, cable TV and shares a bathroom with Twin Bedroom 3. 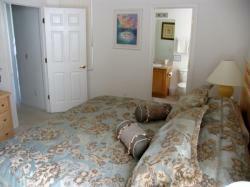 This vacation home has a state of the art kitchen providing all the necessary comforts of home. There is a large Refrigerator/Freezer, Microwave, cooker, coffee maker, double sink with waste disposal, dishwasher, washing machine, tumble dryer, iron and ironing board, larder and all the pots, pans, crockery and cutlery you could need. There is also a telephone. There is a dining area adjacent to the Kitchen with a dining table and chairs situated next to the bay window. The open plan layout of the home, together with its high ceilings, gives an airy restful atmosphere, which will enhance your stay. The lounge is fully carpeted and has Three comfortable leather sofas (one of which converts to a queen sized bed), coffee and side tables, Cable TV, DVD player with surround sound, subtle, ambient lighting, air conditioning and a ceiling fan. This luxury villa is well equipped and furnished to a very high standard. There is also free use of a cot/crib and highchair should you want to use them. The house is fully air conditioned. Which can provide heat should the need arise!! 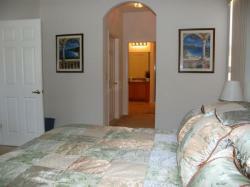 The villa has a telephone system, one in the Kitchen and one in a Master bedroom. Local calls are free, long distance and international calls can be made via a telephone calling card widely available throughout the area. The price includes all gas, electricity, linen, towels State, County and Tourist Taxes and end of stay clean. Peace of mind knowing that our management company is only a phone call away should you need them. Everything you need to make it your home from home.